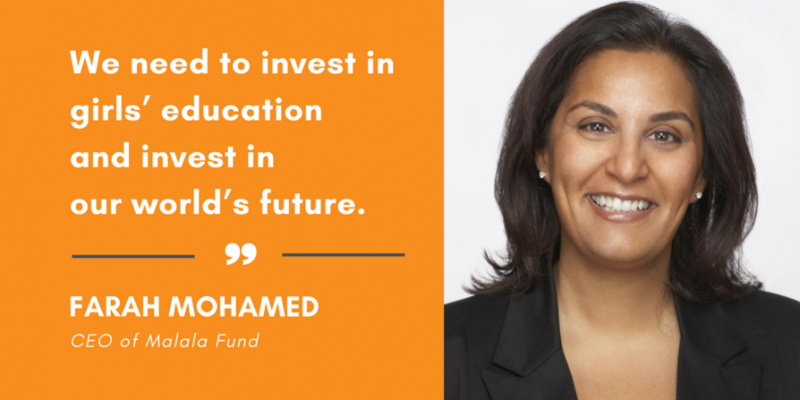 Farah Mohamed is Chief Executive Officer at Malala Fund, where she leads on guiding and expanding the organisation’s work to ensure that all girls have the ​opportunity to learn for 12 years. Prior to joining, she served as founder and CEO of G(irls)20, a social enterprise dedicated to girls’ education and economic participation. 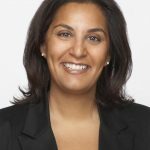 Farah also held senior leadership positions at The Belinda Stronach Foundation, VON Canada and worked for several Canadian politicians. The future success of our economies depends on women — but it begins with girls. We need to provide every girl with quality secondary education, which will expand women’s access to formal jobs and help break the cycles of poverty. Today, only 46.6% of women participate in the labour market, compared to 76.1% of men. This imbalance is not only to the detriment of women, but to the detriment of every economy. Women could add as much as $28 trillion or 26% to annual global GDP by 2025 if their workforce participation was equal to men. Research in OECD countries found that level of education has a “substantial impact on employment prospects.” In order to see more women in the workforce, we need to increase girls’ access to 12 years of free, safe, quality education. That means a full course of primary, lower secondary and upper secondary education. As described in “Safer, Healthier Wealthier,” a recent paper from Malala Fund and Global Education Monitoring (GEM) Report, basic education is not enough to prepare children for the needs of the job market. Developing and emerging economies will soon face a surplus of low-skilled workers and a deficit of professionals. This will lead to unemployment and major gaps in the labour market. UNESCO estimates that by 2020, the world could have 40 million job vacancies, but not enough educated workers to fill them. In addition to providing girls with 12 years of school, we need to provide them with a quality education. For too long we have been teaching our youth the same things, while the job market has been changing. We need to nurture creativity, innovation and resilience. We need to teach financial and digital literacy, an entrepreneurial mindset and communications skills. We might not know exactly which jobs will be on the market in 15 years, but with a quality education, girls will know how to think and adapt to meet those challenges. The benefits of girls’ education are clear. A dollar invested in an additional year of schooling, particularly for girls, generates earnings and health benefits of $10 in low-income countries and nearly $4 in lower-middle-income countries. If all children in low-income countries completed upper secondary education by 2030, per capita income would increase by 75% by 2050. An investment in girls’ education is an investment in global prosperity. We must work together to ensure every girl can complete 12 years of free, safe, quality education and become productive members of the workforce. There are more than 130 million girls out of school. War, tuition fees, child marriage and gender discrimination are just some of challenges they face everyday. Malala Fund is working to break down these barriers to education in areas of the world where girls are most vulnerable. Much has been said and written about women in the workforce. How women can climb the corporate ladder. How we can make workplaces more flexible. How we can rectify the inexcusable gap in income equality. These conversations are important. But the fundamental problem remains that women can’t succeed in the workforce if they aren’t participating in it to begin with. We must address the core problem that there are not enough women in the workforce because there are not enough girls in the classroom. In allowing more than 130 million girls to be out of school today, we are holding back companies from their innovations. We are holding back countries from their economic contributions. We are holding back these girls from reaching their full potential. We need to invest in girls’ education and invest in our world’s future. UNESCO (2016) Global Education Monitoring Report 2016. Education for People and Planet: Creating Sustainable Futures for All. Education Commission (2016) The Learning Generation: Investing in Education for a Changing World.